The other side of the life-saving bond coin! Yesterday, I shared an article about what flowed from the bond between ex-shelter dogs and special needs children. It underlined what so many dog lovers instinctively understand: The magic that flows from the relationship of a dog to a person, disadvantaged or otherwise. However, or perhaps better said inevitably, the obverse face of that life-saving bond practically guarantees that the loss of that bond results in huge stress and emotional turmoil for the dog. In other words helping our beloved dog cope with the loss of a family member is something else that we can be helped with by others. That leads me neatly on to a comment left by ‘Small Talk’ to my Putting A Smile On Your Dog’s Face post last week. 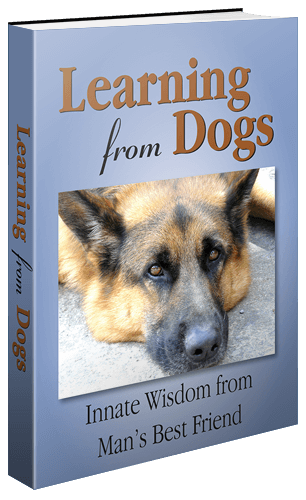 Very good article…check out this article I wrote about dog depression… cheers! I liked the article and asked for permission to share it with you here. That permission was promptly given. Whether it’s a death in the family, a child leaving home, or a divorce, your dog will notice that one of his “pack” members is missing. Learn to help him deal with his grief. Grief has many forms, and can arise from many situations besides the death of a loved one. A relationship breakup, a child leaving home, even a prolonged business trip or hospital stay are all examples of family changes that can cause feelings of loss and grief in those remaining at home. That grief can be felt even more keenly by your dog, who doesn’t understand where the missing person is and when or even if s/he will be back. My own dog became extremely sad when my husband left for an extended trip. Every time I sat down, he jumped in my lap (no small task since he weighs 50 pounds), lay his head on my arm and sighed pathetically. He poked around the house with his head drooping like a deflated balloon. I asked veterinary behaviorist Dr. Nicholas Dodman about my dog’s behavior. “Dogs can get into a funk or lose interest in life because of separation,” he told me, adding that even short absences can cause changes in behavior. “For instance, if a man goes out to play a game of golf for five hours, the dog will feel temporary loss, but will be relieved when the owner returns. He seems down and depressed. He has lost interest in things he formerly liked to do. He’s listless, not playing with toys. His appetite changes – typically, a grieving dog eats less and may lose weight. He shows signs of anxiety. His energy seems low when he’s out for walks. In extreme cases, bereavement can cause compulsive behaviors like incessant licking. Many separations and losses in life are inevitable, which means you have to help your dog adjust to the absence of the missing family member. If you’re also grieving, it might be easy to overlook your dog’s feelings; but one of the best ways to help both of you is to try and find ways to make life happy and interesting again. Act in an upbeat way around your dog; sympathy will actually make his depression worse because he’ll pick up on your own emotions. Dog behaviorist Bill Campbell calls this the “Jolly Routine”: when you act happy or jolly, it helps lift the dog’s mood. An old proverb states that “a cheerful heart is good medicine”. Being upbeat, fun and positive is good medicine for your dog (and for you). Give your dog lots of attention — treats, new toys, extra walks or play sessions. Throw a ball. Let him play with other dogs. Consider getting him a new friend in the form of a puppy, if circumstances allow. When you go back to work after the loss or separation, don’t leave your dog at home alone. If your workplace allows, take him with you, or have him stay with a friend or family member he knows well. The good news is that your dog’s grief will ease over time. He may feel low for a few weeks, but it’s generally temporary. As his owner, being aware of his suffering and taking the necessary actions to help him through it will speed his (and your) recovery and adjustment. Dogs don’t just grieve when people in their lives die or go away. It’s also common for a dog to grieve over the loss of another dog he was closely bonded with. Dogs in the same household may play together, sleep together, operate as a pack, so the loss of one has a deep impact on the other. Here’s one dramatic example involving two dogs in the same home. The older dog became terminally ill and needed to be put to sleep. The owner arranged for his healthy dog to go for a long run while the other was euthanized. Back home, the owner buried the older dog in the garden, covering the grave completely so it was basically indistinguishable from the surrounding area. When the healthy dog was brought back from his outing, he ran around the house looking for his buddy, then begged to go outside. He immediately went to his friend’s grave and lay on it for three days. A few words of reflection from me following Jennifer Hinders useful article. Death is inevitable. For both our beloved pets and, for that pet, their beloved humans. As they say about death and taxes! But for that pet the loss of their beloved human can come about for other reasons apart from death. Yet in the midst of say a divorce, or a loved young person leaving home to make their own life, it must be all too easy for people to lose the focus on what that means for the family pet, especially the family dog. Maggie lets me know when I return home after an appointment that she is displeased. When Abby & Sophie passed away, we stayed close to Mags giving her extra cuddles, etc. This was an excellent share! I just asked Jean if any of our dogs showed their displeasure when we had been away. Jean thought not but then perhaps to be expected with there being 7 dogs in the house. Give Mags a hug from us! This is a great article and I enjoyed your recommendations for helping a grieving dog. When my mom was in the hospital last week, her dog Norton was really depressed. I let him sleep in my bed and would slip him an extra treat when his brothers were not looking. Also, best wishes to your Mum. Well done, Paul! Yes, it’s true dogs do grieve, I’ve seen it first hand. It’s ‘impawtant’ to deal with our ‘fur-iend’s’ emotional needs especially at a time of loss. When my furbro Mickey Moo past away my huMom let me say goodbye before they laid him to rest. She believes it is an important step in the grieving process. My huMom doesn’t leave without me very often but when she does (I am never left alone because I live with canine epilepsy) it’s like the world has ended. I just wait by the door for her return. There are treats & walkies & they do help pass the time but I just want my huMom home. Sounds like a very loving and understanding place for you!! Yes, a good reminder that dogs do grieve in their own way. Yes, years ago we were recommended to get Pharaoh a puppy GSD as a companion. It has worked out so well plus Pharaoh, somehow, has taught Cleo everything! I’m certain that will happen. Science is starting to inform us that our animals have much more in the departments of feelings and consciousness that hitherto assumed! Many who come to this place know that!! Thank you and welcome to this place. Hope to see you again.